A San Francisco City Attorney has issued a stern public notice to Monkey Parking to cease and desist. The app allows users to bid off their public parking spaces when they are ready to leave, which stirs up a bidding war between drivers seeking elusive city parking spots. The peer-to-peer bidding app is technically illegal according to San Francisco Police Code section 63(s) which states that anyone who enters into a lease, rental, agreement, or contract for public parking can face a penalty of $300 for each violation. This means drivers using the app can face a fine for each violation. Further, since Monkey Parking is profiting from illegal transactions, the company can face up to $2,500 fines for each violation under the California Unfair Competition law. 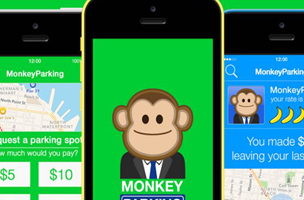 In an email to the Wall Street Journal, Monkey Parking defended its app and its ability to help motorists, but not if the app is banned. Accordingly, Sweetch and Parkmodo will see similar cease-and-desist letters from the city. Sweetch allows drivers to get $5 each time they give up their parking spots while ParkModo employs drivers at $13 an hour to occupy public spots for other motorists. Sweetch and ParkModo members who make use of the apps to park in San Francisco are also subject to civil penalties of $300 per violation, and both companies are potentially liable for civil penalties of $2,500 per transaction for illegal business practices under the California Unfair Competition Law. Of course, parking in the city is a contentious issue for drivers, who often complain about lack of parking but not lack of parking tickets. The city might be defending its parking territory, but pan handlers regularly protect spots around town in order to make a quick buck. The city should just provide its own parking app.